Watch this space, ask to join our mailing list, or find us on Facebook to get the latest news about future events! 1.30: See a demonstration of the Community Collection platform - and then explore it for yourself! All afternoon: Try out the new Hispanic Liverpool Database - are your ancestors included yet? Were there Spanish families in your street? How many people came to Liverpool from Madrid, Mundaka or Manila? 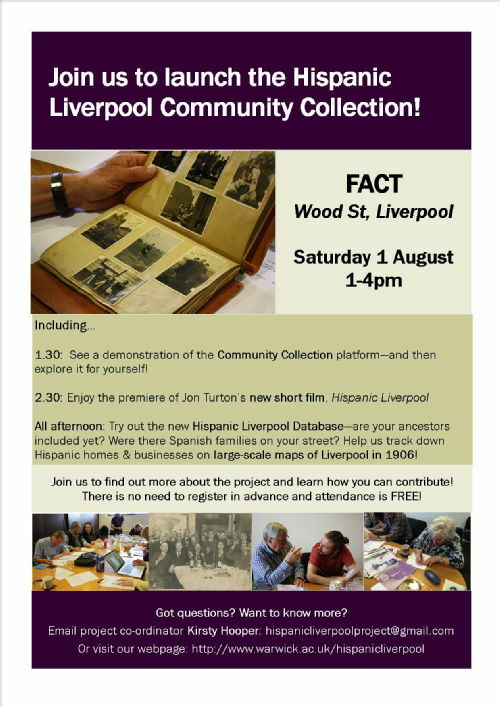 Help us track down Hispanic homes and businesses on large-scale maps of Liverpool in 1906 - where did Liverpool's Hispanic communities live and work? What traces have they left behind? 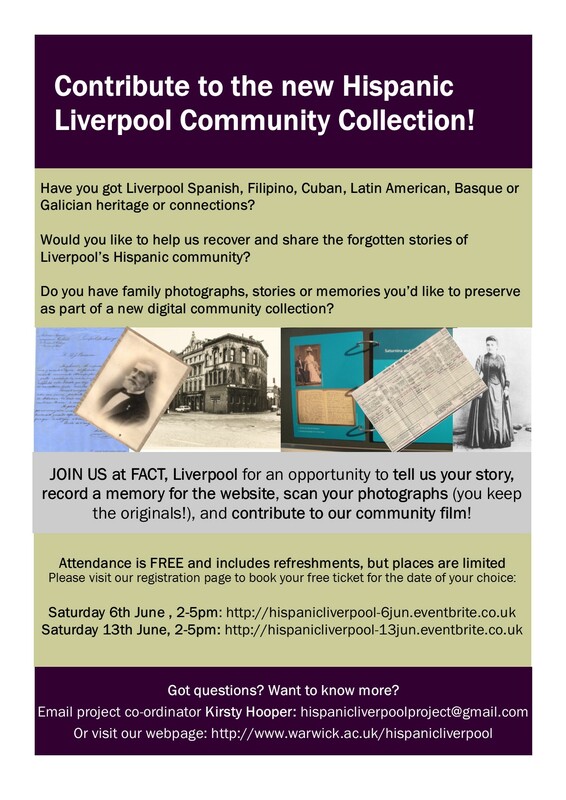 These two events at FACT in Wood Street invited people with Liverpool Spanish, Filipino, Cuban, Latin American, Basque and Galician connections to come and share family photographs, stories and memories as part of a new digital community collection. Almost 30 people attended the two sessions, and contributed digital stories, photographs and documents. We even admired a hand-sewn Basque flag from the 1930s and a hand-drawn diagram of no. 160 Park Lane! Laura Yates co-ordinated the recording of the digital stories and Jon Turton captured it all on film, while Nicky, Poppy and Carlos scanned photographs and provided tea and coffee. Many thanks to them, and to everybody who came, listened, laughed and contributed! 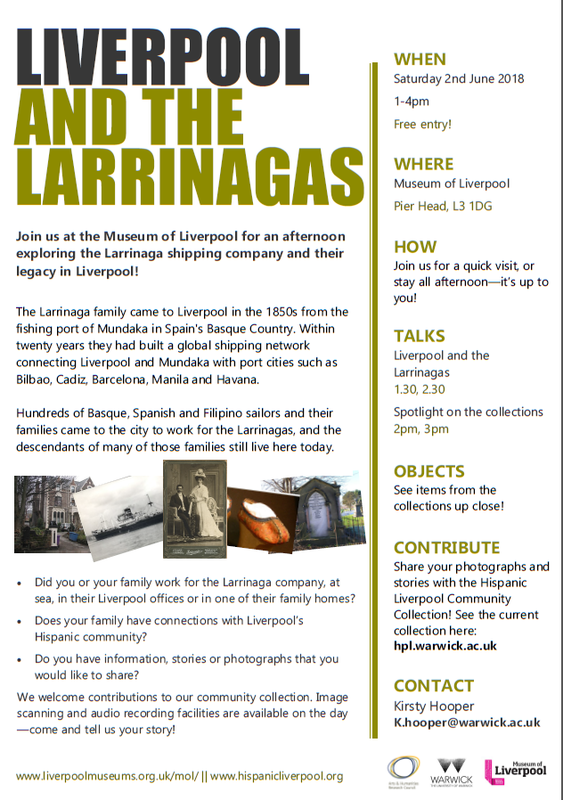 This event, at Liverpool Central Library, explored the forgotten history of the Spanish, Basque, Galician, Filipino and Latin American communities who settled around Liverpool's waterfront in the 19th century and whose descendants still live in the city today. 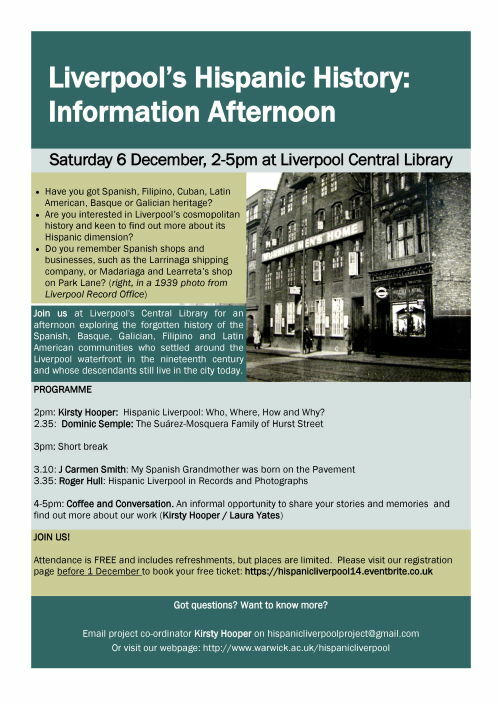 It included opportunities to find out more about the Hispanic Liverpool Project and Liverpool Record Office, and to hear from two family historians who have researched their families' Spanish and Liverpudlian roots. Speakers: Kirsty Hooper, Dominic Semple, J Carmen Smith, and Roger Hull. Many thanks to everybody who attended and participated!